North Central Florida sees its share of heavy rains, high winds and hard-hitting storms, all of which can put your home, business and property in danger of fallen limbs and damaged trees. At SkyFrog Tree Service, we provide full emergency tree removal services to remove trees, limbs and debris from damaged areas. We can also provide further tree trimming services to help keep your property safe from the next storm. Contact us today for a free tree removal estimate, or call us anytime for emergency assistance. Our 24-hour emergency response services provide removal of storm-damaged trees and limbs. We can also make emergency repairs to damaged roofs including waterproof tarp coverage, debris removal from the damaged area, and removal of additional hazardous limbs. We prepare for emergencies ahead of time so that we can be ready when we’re needed. Don’t wait or try to remove dangerous trees yourself — contact us today. Cleaning up after a hurricane or tropical storm can seem like an overwhelming task. Whether you choose to clean up yourself or hire a professional tree removal company, such as SkyFrog Tree Service, safety should always be your first priority. When cleaning up yourself, always work with at least one other person and take periodic breaks to prevent overexertion injuries. During clean-up, identify which tasks you and others can handle and what should be left to the professionals with SkyFrog Tree Service, such as any clean-up that requires climbing. Once a hurricane or tropical storm has passed, it may seem like the worst is over. But, there are many dangers to be mindful of as you go outside to survey the damage. Keep an eye out for these common hazards in Gainesville after a storm. Treat every downed, hanging, or loose power line as though it’s live. If you’re outside surveying the damage or cleaning up, look up to make sure you don’t come into contact with hanging or loose lines. Don’t drive through standing water if you can see power lines touching the water. A good way to minimize downed power lines is to speak with an arborist in Gainesville with SkyFrog Tree Service. Our certified arborists will look at the trees on your property and make recommendations for pruning and removal of branches, limbs, and trees, which may affect power lines in a storm. Buckling, bowing, or uneven floors. If your property has damage after a hurricane or tropical storm, there are three main hazards to be aware of as clean-up begins. 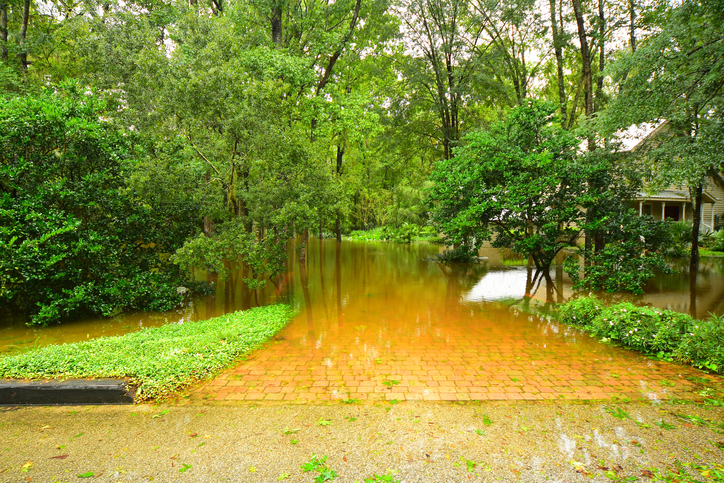 Flooding and erosion usually go hand-in-hand after a hurricane or tropical storm. Unfortunately for trees, this combination can be a double-edged sword. Flooding can weaken the roots, trunk, and overall structure of a tree since the tree is unable to absorb the massive amount of water. Erosion exposes the root system and makes it susceptible to damage from many sources. If additional flooding occurs once the root system is exposed, the entire tree can become unstable and fall on the property. If your trees have been subject to flooding and erosion during or after a storm, call SkyFrog Tree Service for a thorough inspection. Our Gainesville arborists provide guidance about what the next steps are for these trees, including care and preservation. After a hurricane or tropical storm passes, the main tree service Gainesville residents call us for is removing fallen trees from a structure. Our team takes all necessary precautions to safely remove the trees while protecting the home, business, or other structures. The layer of limestone beneath the ground in Florida makes our state a prime location for sinkhole development. Tropical storms and hurricanes often produce substantial amounts of rain in a short amount of time and increase the chance that sinkholes will develop. If a sinkhole forms on your property, first make sure you and loved ones are safe. Leave the home and property if necessary. If it’s safe to stay, notify local officials, such as the building inspection department and your property insurance company. Then, use fencing, rope, tape, or other materials to mark the location of the sinkhole. After a storm, the trees on your property may have varying degrees of damage. SkyFrog Tree Service has a team of Gainesville arborists who will inspect the trees and determine which trees can be preserved and which ones should be removed. It’s important to work with trained arborists to ensure further damage to the surrounding landscape, property, and trees is kept to a minimum. Our team will create a custom tree care plan for your trees, including growth regulation, root excavation, and supplemental tree support if applicable. SkyFrog Tree Service can also help replace lost trees and establish new trees in your landscaping. For professional tree removal Gainesville, FL, residents can count on after any storm, call SkyFrog Tree Service today!